Description: A set of CN power lays over at Worldport as CN called it then. The 6006 is in the CN North America scheme, AKA the blob. Title: CN 331 at Mile 5.8 Strathroy Sub. Description: CN 331 with a nice and somewhat rare leader. 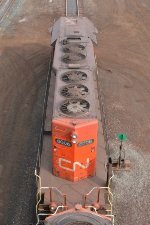 Description: Empty iron ore train heads to Minntac.